It seems like everyone is getting ready for fall lately. Summer temperatures are still with us, but we’re all dreaming of cooler weather, pulling out our cold-weather gear, and packing our crochet project queues with designs suitable for autumn. One thing I never seem to have enough of in my fall wardrobe is crochet shawls. I love them and wear them all the time because they’re so practical—they’re absolutely the perfect layering piece—but they’re so beautiful, too. 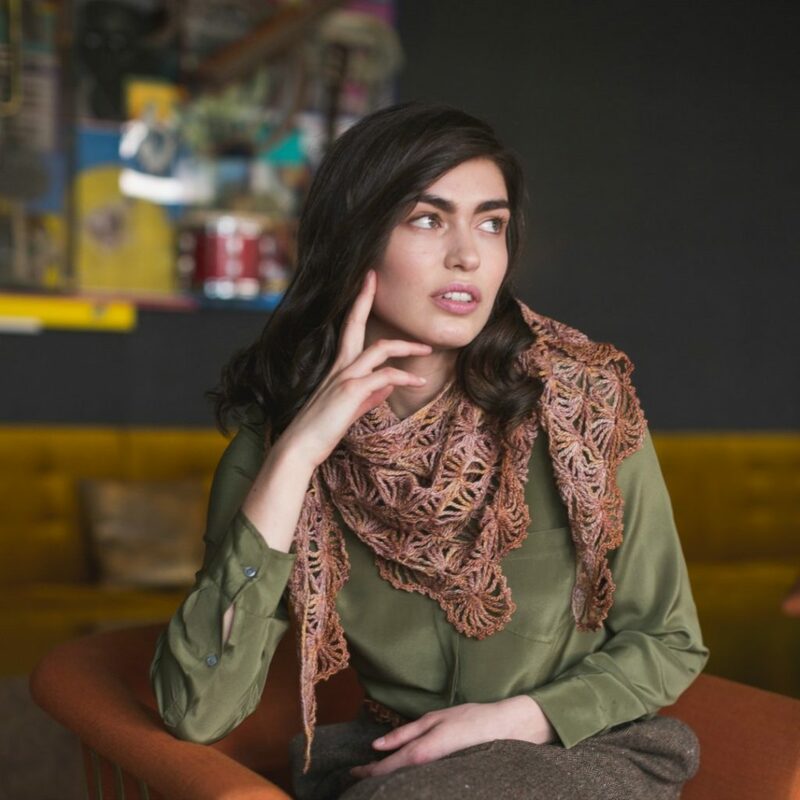 Case in point: the Mondaine Shawl from Interweave Crochet Fall 2018. This beauty caught my eye as we were working on the issue, and I immediately added it to my fall crochet queue! It’s a deceptively simple shawl packs a major visual punch, and it’s exactly what I need to spice up my fall wardrobe. I’m obviously totally sold on this shawl, but I know what you might be thinking: you have enough crochet shawls. You don’t need one more. You don’t even have room in your closet for one more! But trust me: you want this shawl. Let me explain. First things first—this shawl is gorgeous. The open shell design and fan pattern combine to create a visually compelling shawl that’s lightweight but definitely cozy enough for fall. This beautiful piece is sure to become your go-to wrap for any occasion (more on that in a minute). Second, the yarn is YUMMY. If you’ve never worked with Manos del Uruguay Fino, I can’t recommend it enough! It’s a wool-silk blend that feels great in the hand as you’re crocheting and equally wonderful when you’re wearing it. Wool and silk are both warm but breathable, so Fino is perfect for the variable temperatures of fall. Plus, the colorway, the delightfully named Pocketwatch, is wonderfully autumnal. Third, this shawl is versatile! I don’t know about you, but I can’t be bothered to make something that I can’t wear everywhere I go! Fortunately, the Mondaine Shawl is a super versatile piece. You can wear it to work, but it easily transitions to after-hours drinks and dinner. It also looks great with jeans and a sweater—I tried it like this a few days ago, when we had an unexpectedly chilly morning, and it was perfection. 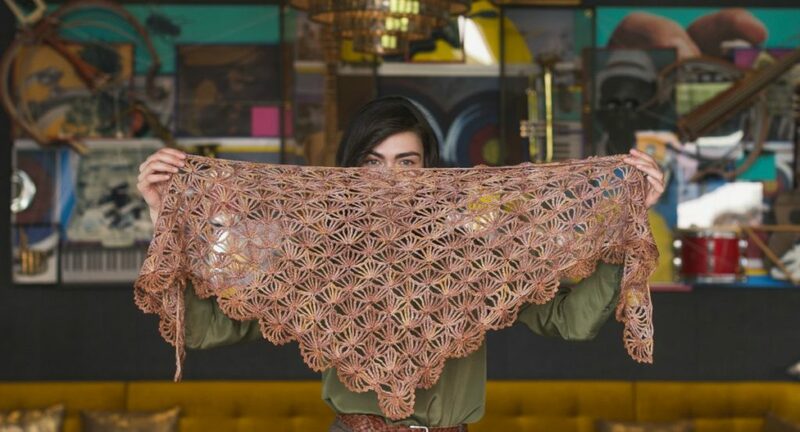 Fourth, and perhaps most importantly, the Mondaine Shawl is a great project for crocheters of all abilities. I’m still a novice, and I was really excited to learn that although this beautiful project looks complex, it’s easy enough for advanced beginners. Worked from the point to the top with increases as you go, this piece will provide a fun challenge for beginners but is still an interesting project for advanced crocheters. 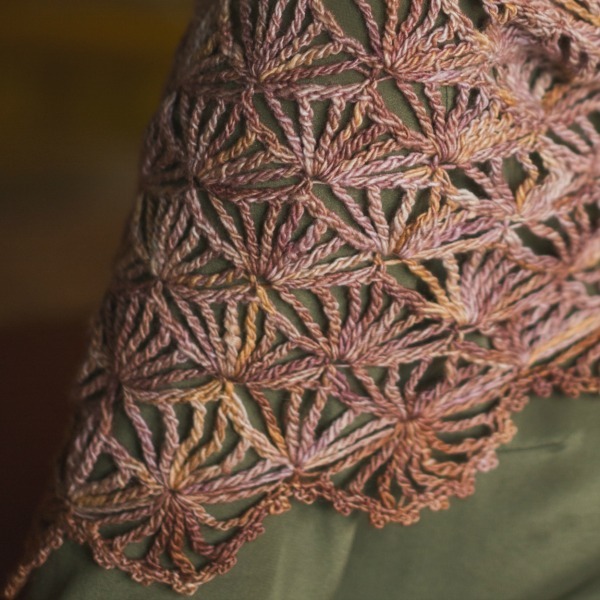 Here’s one more reason to crochet the Mondaine Shawl this fall: it’s now available in a kit! You’ll get a copy of Interweave Crochet Fall 2018 and two skeins of Manos del Uruguay Fino; you just need your hook and a good podcast queued up, because once you start on this delightful pattern, you won’t want to stop. 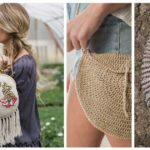 Trend Alert: Crochet Circle Bags!